While not a second-hand store junkie, I do like to occasionally make the rounds of the local Salvation Army, Goodwill, and other independent shops to see what kind of relics are donated. Since eBay, Etsy, and their kind have gained immensely in popularity, it is getting harder to find anything useful other than clothes and kitchen wares. A few months ago Goodwill had a 1910s vintage cabinet -style Edison disc phonograph (as opposed to wax cylinder) that was in very good condition, complete with a handful of styli and a couple old records. The original finish over smooth mahogany and burl veneers had only a few scratches and could easily be polished to look practically new. The metal hardware could have stood a fresh coat of black paint due to nearly a century of oxidation. Even the original nomenclature plate looked factory-new, and a clearly legible paper plaque of operating instructions was embedded beneath a layer of shellac. I expected an asking price of at least $500, but was shocked to see only $125 on the price tag. Surely, I thought, the employee who affixed the tag must not have realized the value of such a treasure of American history. Out of curiosity, I put a fresh steel needle in the tone arm and placed a vinyl album gotten from the music area in the store on the platter and cranked 'er up. The sound was barely discernable, so that ruled out any possibility of justifying the purchase on the grounds that I could impress visitors by playing my Boston or Styx albums on it. If I had a place to keep it, I would have snatched it up in a heartbeat, but my 920 sq.ft. house is about outfitted to capacity with historic artifacts. I wrote down the phonograph's model number (C150) to look up on eBay what similar examples were selling for, thinking if I could buy it and sell for a handsome profit, but alas, a search of the "Sold" items showed only piece parts like crank handles and tone arms had actually been sold. Part 6. More on development of early Edison phonographs including data on maintenance. Thomas A. Edison listening to his "Triumph" phonograph in his laboratory. This photograph was taken in 1906. In part 5 of this series (March issue) we described several of Edison's phonographs made before the turn of the century. 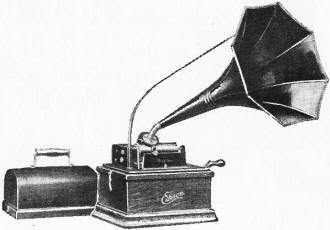 Among these was his "Home Phonograph" first produced in the year 1896. Following publication of this article we have been literally deluged with requests for information as to the availability of parts and for information on repair techniques for his early models. Many of our readers are in possession of Edison's "Home" and "Standard" models. These were the two best sellers in their day and many thousands of these were produced. Original instruction books have been lost through the years and without this information the phonograph collector is greatly handicapped when attempting to restore his cylinder machine. Fig. 1 - Sketch shows details of the Edison "Home Phonograph" Model A, circa 1898. Parts are identified in legend at right. Fig. 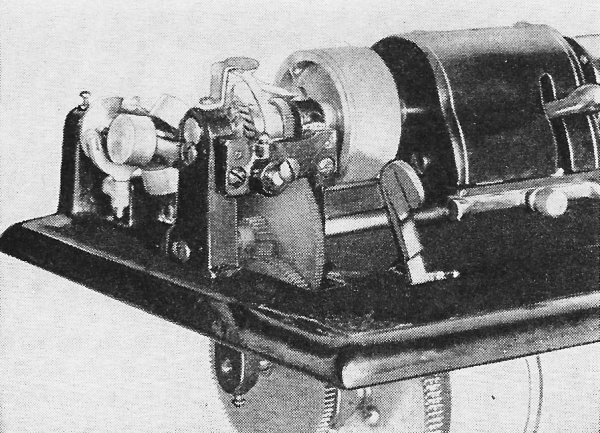 2 - Edison's "Fireside" unit played both 2- and 4-minute cylinders and came with a dual-stylus reproducer. The following is from an original instruction book published in 1898 "for the Edison Home Phonograph." Because his "Standard" model is very similar, the maintenance technique will apply to the "Standard" as well as the "Home." "Before winding or starting the machine, see that all working parts are free, particularly that there is no dirt or packing in the gear wheels, and that all set screws are tight. Sometimes these screws work loose from shock. "The Phonograph, like every other good mechanism; should be clean and free from dust. Instructions as to oiling will be found later in these directions. "See that knife adjusting screw (22) is screwed entirely back, or until the stop pin rests against the casting of the speaker arm, as it always should do except when shaving. This screw controls the shaving knife, and draws it away or forces its cutting edge against the wax cylinder. "As a precautionary measure, it is well to look to the belt (7), the shaft (2), and the speaker arm, before starting the machine. All machines are completely adjusted before shipment from the factory. They will sometimes, though not often, become disarranged in transit. The tension of the belt (7) should be moderate, and the belt-tightening idler pulley (not shown in engraving but easily found on the machine) should be in proper place against the belt. The main shaft (2) turns on centers (8 and 10), between which it should run easily. If centers are too tight they will bind the shaft, while, if too loose, the end-shake will destroy the accuracy of the reproduction. There should be no end-shake here. The shaft adjustment is regulated by the adjusting screw (12) on the swing arm center. A simple test is to throw off the belt with the hand, and see if the shaft will spin freely without noise. The main shaft pulley (32) should of course be tight on the shaft. Its set screw (37) regulates this. The main shaft centers are regulated by set screws (9 and 11), as shown in the drawing. Care should be taken that the large end of the mandrel (1) does not touch the center lug of the body casting. The thickness of a piece of paper between the lug and mandrel is sufficient clearance. The speaker arm or carriage of the machine should work free on the back rod (6). Fig. 3 - The Model K "combination" sound box or reproducer. Refer to article. Fig. 4 - Two separate sapphire points are coupled to the diaphragm. See Fig. 3. Fig. 5 - The 4-minute sapphire in playing position. It has a tip radius of 0.0045". "All bearings should be oiled, as mentioned before, and to obtain the best results from the motor the gears must be kept clean, particularly the fine-toothed gear which engages the governor pinion. The governor disc (the flat metal plate against which the horseshoe rocker works) must be oiled occasionally. If necessary to adjust the governor, see to it that there is a slight play between centers. If too tight there, regulation is impaired and efficiency is diminished. "Under no circumstances should the governor disc, described above, touch the adjacent gear. "The first operation will undoubtedly be reproducing. Raise lift lever (15) to its highest point. Push speaker lever (18) to its highest point, against speaker adjusting screw lug (17). Throw down lock bolt (14) and open swing arm (13) wide. Slip the wax cylinder (28), beveled end foremost, upon the tapering brass mandrel (U, and press it firmly, but not too forcibly, into place. Close swing arm and re-lock it. Now place hearing tube (25), or horn, on the speaker tube (reproducer) plate (21), slide speaker arm to point where record appears to begin, and drop lift lever (15), after having first thrown start and stop switch (24) to the left. "With the Automatic Speaker (type C reproducer) the following adjustment is unnecessary, as the reproducer (Continued on page 168) adjusts itself to the track or groove made by the stylus. With the Standard Speaker (a combination reproducer equipped with. both recording and reproducing sapphires), it sometimes occurs that clear reproduction is not at first obtained. To obviate this, unscrew the adjusting screw (16) until its point disappears in the lug (17), and while listening, press the speaker lever (18) upward with the thumb of the right hand, and with the first and second fingers of the same hand turn the adjusting screw (16) slowly down until you can hear the record distinctly. Adjustment will bring the reproducer ball (stylus) into the groove of the record. "The speed of the machine in revolutions of the main shaft per-minute is regulated by the speed adjusting screw (23). To increase speed, screw the nut down, and to decrease it, unscrew this nut. Observe this carefully when reproducing music, as a different speed from that at which the music was recorded will produce an entirely different pitch. The standard pitch at which musical records are taken is about 125 revolutions a minute; talking records, about 80 per minute. "A very good way for the beginner to determine the number of revolutions per minute is to hold his finger lightly against the main shaft pulley set screw (37), and count the revolutions by his watch, for ten or more seconds. "The machine is at rest. Open speaker clamps (19) and insert recorder with its speaker lever (18) pressed up against lug (17). Press up lift lever (15). Throw down lock bolt (14), and open swing arm (13) wide. "Slip the wax cylinder (28), beveled end foremost, upon the tapering brass mandrel (1), and press it firmly, but not too forcibly, into place. Close the swing arm, and re-lock it. "Raise the speaker arm from the straight edge upon which it rests in front, and slide to the left until directly over the beveled end of the cylinder, or the point at which you wish the record to commence. Again lower it to straight edge. Everything is now ready to record. "Start the machine by pushing the switch (24) to the left. The machine is now in motion. 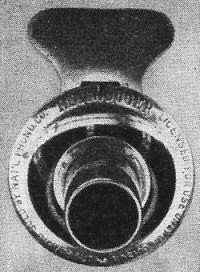 Place speaking tube or horn upon the tube plate (21) of the speaker, lower lift lever (15) as far as possible and commence recording. In speaking into the instrument use a clear voice, and articulate well. Do not force the voice or speak too loud, if best results are sought. "A fine white shaving will appear on the surface of the cylinder where it has been passed over by the stylus. Remove the horn or speaking tube; raise the speaker arm, and throwing it back as far as possible, dust off the shavings, by holding the camel's-hair chip brush against the revolving cylinder, and passing it slowly from left to right. "The wax cylinder, which is somewhat brittle, should be handled gently at first until the operator becomes practiced. "Thrust the first and second fingers of the right hand into the thick end of the cylinder, and hold it fast by spreading the fingers apart. Touching the outside surface of a prepared cylinder, or record as it is called, destroys the attractiveness and generally' the value of such record. "Cylinders should be kept in boxes or cabinets made for the purpose, which have perpendicular pegs at fixed distances to prevent cylinders from coming in contact with each other. Over these pegs they are placed beveled 'end down. Use the camel's-hair chip brush to remove chips and dust from the wax. Do not attempt to blow it off. Fig. 6 - Edison's "Triumph" model was a rugged triple-spring unit. Fig. 7 - Edison's "Standard" was popular. It had a "cygnet" horn. "Do not leave the cylinder upon the brass mandrel (1) of the Phonograph for any length of time when the machine is not in use. 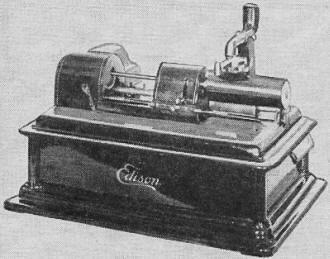 "Every Edison Home Phonograph is equipped with a simple device for shaving off or smoothing blank cylinders, which preparation is necessary before a blank can be used for recording. Here are the instructions for operating the turning rest. Machine is at rest. Wax cylinder firmly set upon mandrel. Hearing tube or horn removed. Speaker lever (18) set as for reproducing, that is, up against lug (17). Fasten back the speaker weight by passing rubber band around lower end of the weight and over the speaker arm. "Lower the speaker arm about over the center of the cylinder, by dropping lift lever (15), Hold the end of the arm down firmly with the thumb and forefinger of the left hand, while the same fingers of the right screw down the button (22) which controls the knife bar. This will bring the sapphire shaving knife to the surface of the wax. As the depth of the cut to be taken is very slight indeed, the knife must be set very gently into the wax, as shallowly as possible. The machine is still at rest, with lift lever (15) down. Now raise speaker arm, slide it back to the extreme left, and start the Phonograph. "The knife should always be allowed to pass over the entire length of the surface of the cylinder, otherwise there will remain a portion of the wax which is thicker than the rest, and if a new adjustment of the knife be made to the right of the end of former cut, it will not touch the surface to the left of It. If adjusted to the left, on reaching that part which was before unshaved, the knife will take too deep a chip, and tear instead of cutting the wax. "If the chip chute becomes clogged, it will prevent shaving. Keep the chute clean by raising the speaker arm from the straight edge, moving the carriage to the extreme right, and striking it gently against the back lug of the casting. Under no circumstance jar out the chips by striking the front of the speaker arm on the straight edge. "If desired, the chip chute can be removed entirely by unscrewing its set screw, and the knife will shave without obstruction. "The thinnest possible shaving will leave the smoothest surface. Shave several times in preference to a single deep cut. "New blank cylinders require trueing, as they are likely to be eccentric, and do not have prepared surfaces. In trueing these, set the knife on the highest part, if any, of the blank When once trued, blanks always remain cylindrical. "When the shaving of a cylinder is completed, see that the knife bar is screwed back away from the cylinder, or it will cut the next record that is put on the machine. This is managed by manipulating the button (22). "Apply oil sparingly but thoroughly to the following parts: Back-rod (6); Main-shaft feed screw (2); Main-shafts centers (8 and 10); Roller on the straight edge; all motor shafts at their bearings; all gear teeth of motor; arbor on which main spring turns; idler pulley, occasionally, where tension spring holds it; governor disc, occasionally; winding shaft, if necessary. "No oil should be permitted to get on the belt, and oil must not be smeared on the machine, as it will catch dust and make trouble. Fig. 8 - The original diamond stylus reproducer used in early Edison machines. "When the oil on the gear tooth gets black and dirty, wash it off with benzine before putting on new oil, which apply sparingly. Use best Phonograph oil, to avoid gumming. Above all, keep the machine clean. No mechanism will work perfectly unless free from grit." Some strange terminology appears in the preceding text. For example, "the speaker arm" is now commonly called the tone arm or pickup. The term "speaker" referred to the transducer, sound box, reproducer and finally the phono cartridge (using present lingo). The "Standard Speaker" was Edison's type B reproducer. The stylus could not self-adjust to seat into a groove. The "Automatic Speaker," known as model C, overcame this limitation and provided lateral seating automatically. Things were indeed difficult in the gay '90's. Making a record of Junior's first words was a day's labor. Cylinder machines were being produced in quantity by Edison and Columbia in the late '90's. All cylinders up until 1906 were of the two-minute type and it was not until 1908 that Edison introduced the four-minute Amberol cylinder records. Owners of the older model Edisons ("Home," "Standard," etc.) were able to buy simple gear attachments, so that these new four-minute cylinders could be played on the older machines. A new reproducer by Edison, type "H," was introduced and this was designed especially for reproduction of the new cylinders. Like other Edison reproducers the stylus was of sapphire. The model "H" had a tip radius of .0045/1. Fig. 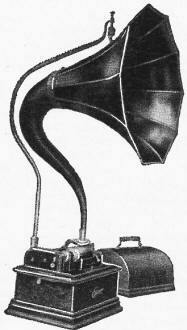 9 - The last of the "Home" phonograph series was this model with its "cygnet" horn. This particular model, a popular one, is discussed in detail in article. In 1909 the Edison "Fireside" model (Fig. 2) was introduced as a "combination type" and featured a brand new development of Edison's, which was his model "K" dual-stylus cylinder reproducer. This device (Fig. 3) was, in appearance, similar to the model "C" and the model uR" and would fit the same housing, but as seen in Fig. 4, employed two separate sapphires (.007" and .0045/1) mounted to two cantilevers and coupled to a common diaphragm. The assembly could be rotated to bring either the two-minute sapphire (for Standard cylinders), or by twisting through an arc of 180 degrees, would bring in the proper stylus to reproduce the new Amberol four-minute cylinders. As far as we know, this was the original dual-stylus phono cartridge or reproducer (Figs. 4 and 5). The Edison "Fireside" Phonograph (Fig. 2) was provided with a sectional type horn finished in japanned maroon with gilt decorations. It was 19 inches long and the bell had 8 petals and measured 11 inches in width. This was supported by a nickel-plated crane. The machine would play the Edison Amberol, Standard, and Grand Opera records. It featured a newly designed single-spring motor that could be wound while running. It also used an improved stop-and-start regulating device. The Edison "Triumph" Phonograph (Fig. 6) known as model "E, F, and G" was an improved model which was produced in 1910. This was the last of the series bearing the name "Triumph." It featured a gooseneck type horn having a bell of steamed oak. This was supported by a crane mounted to the rear of the cabinet. Note that the carriage supporting the reproducer is designed to lie flat above the rotating mandrel. By means of adapters this housing would contain the Edison models "C," "H," "K," or "0" reproducers and, in addition, permitted Edison's new diamond point reproducer to be used when playing the Blue Amberol four-minute records which were introduced two years later, in 1912. 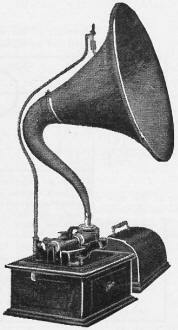 The series of "Standard" Phonographs of Edison also underwent improvement and change. The one shown in Fig. 7 was his model "E, F, and G" which also had the flat type carriage to contain the reproducer. 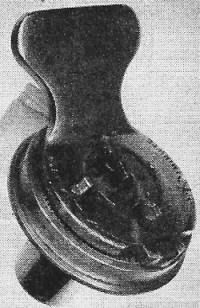 This model was supplied with a black japanned metal horn which was supported by a nickel-plated crane and was coupled to the reproducer by means of a short section of rubber hose. This was a dual-speed phonograph and would play either the two-minute or four-minute cylinders simply by changing the gearing. The reproducer housing would also accommodate the diamond reproducer (Fig. 8) that was introduced along with the Blue Amberol cylinders. Fig. 10 - A favorite with collectors is this small "Gem" model phonograph with its "Fireside" horn. The Edison "Home" Phonograph also underwent considerable change. This model was redesigned so that it would play either two- or four-minute cylinders. The model "E, F, and G" shown in Fig. 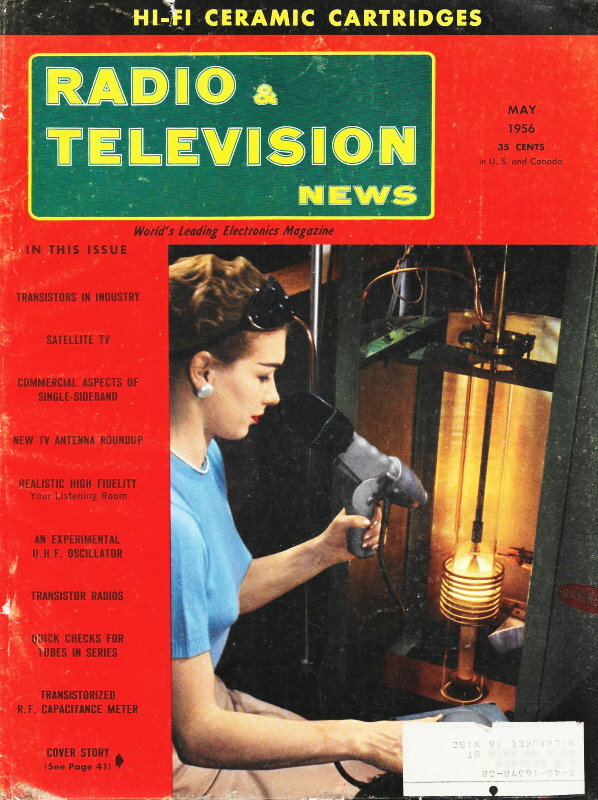 9 was supplied with both two- and four-minute reproducers and, like the machines previously described, would also accommodate Edison's new diamond stylus reproducer. The accessories for this model of the "Home" are similar to the previous types. Note that the swinging gate used on the earlier model Edisons has been eliminated in the new designs. This was a much needed improvement and saved considerable time when placing or removing cylinders from the machine. The last in the series of Edison "Gem" Phonographs (Fig. 10) was known as models "D and E." This was supplied with Edison's "combination type" reproducer (type K) and was finished in maroon and gilt enamel. It was mounted to a polished oak base and was provided with an antique oak dust cover. The motor was a newly designed single-spring type that could be wound while running and it also featured a new start and stop regulating device and speed control. The gears were enclosed in a cast iron housing to protect them from dust. To the side of this housing may be seen the knob which was used to alter the gearing when changing from two- to four-minute cylinders. The Phonograph came complete with the "Fireside" type horn which was also of japanned maroon and decorated with gilt. This particular model was first produced in 1908. Fig. 11 - A deluxe phonograph was this Edison "Opera" model with its diamond reproducer. big horn. Fig. 14 - Operating lever caused feed to engage to move the sliding mandrel of unit. The Edison "Opera" Phonograph (Fig. 11) was first produced in 1911. It was later called the "Concert." 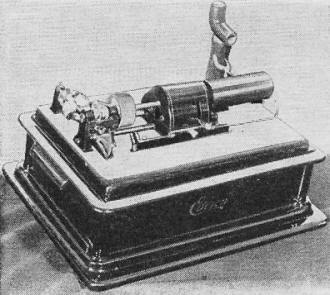 This deluxe phonograph was designed especially to take full advantage of Edison's Blue Amberol cylinders. It featured a moving mandrel assembly and a series of cams which performed the function of engaging the feedscrew while at the same time lowering the reproducer onto the revolving cylinder. 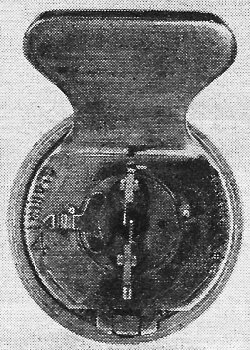 This model also had an automatic stopping device which could be set to the last groove on a cylinder and the machine upon operating to that point would automatically apply the brake to the governor of the spring motor. A deluxe gooseneck type horn, having a large bell of steamed oak, was supplied with this model. It was capable of producing enough volume to fill the average concert hall of its day. Fig. - 12. 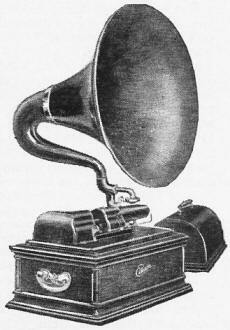 The mechanical parts used in phonograph were precision made, many of them being tooled from solid brass. The entire mechanism was skillfully assembled of heavy-duty parts throughout. Most of them were of solid brass (Fig. 12). This model employed a heavy-duty, spring-wound motor capable of playing up to a dozen cylinders per winding and its speed was regulated by a heavy-duty, three-ball governor in conjunction with a weighted flywheel. The entire gearing mechanism was protected from dust by a cast metal cover. The essential difference between this and other machines of Edison is that instead of the reproducer traveling above a fixed mandrel, in this model the reproducer assembly remained stationary and the mandrel assembly (including the cylinder) was propelled across and under the reproducer. This assembly rode on solid rails. Due to the demand from various educational institutions and from music dealers Edison produced a special phonograph called the "Opera School" type (Fig. 13). This machine was produced in limited quantity during 1912. It consisted mainly of the various parts used in the regular "Opera" model, the essential difference being in the size of the horn which was of metal throughout and which was found capable of producing more volume than the machine designed for home purposes. The top view of the mechanism of this model (Fig. 14) shows the moving mandrel and housing, the automatic stop and the mounting for the reproducer and for the horn. Fig. 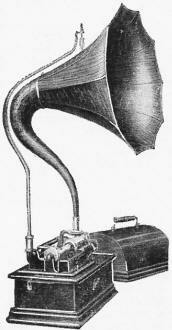 13 - A large metal horn was supplied" with this model phonograph for school use. The operating lever (Fig. 15) seen in the center of the mandrel housing is in the operating position which lowered the stylus to the cylinder and at the same time engaged the feedscrew which rotated beneath. This caused the mandrel assembly to move laterally beneath the reproducer. Fig. 15 - Operating lever also dropped the reproducer onto the revolving cylinder. A recording attachment (Fig. 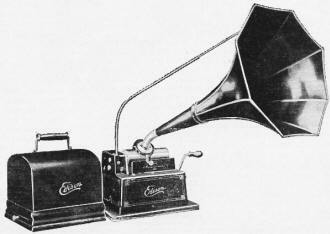 16) was offered as an accessory to this and other Edison phonographs. 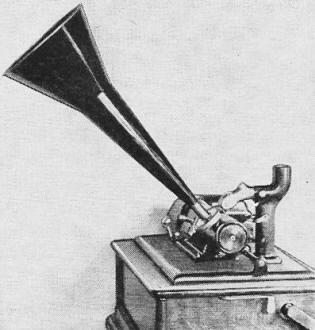 It included a metal horn and the Edison Recorder which were designed originally to record on the soft wax cylinders. We doubt if many of these attachments were sold since home recording on wax cylinders lost popularity after the turn of the century when records became abundant and when results were far superior to those obtained with the attachments. 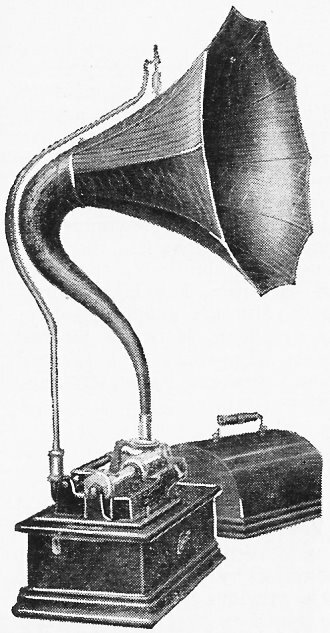 The last of the Edison phonographs using outside horns were produced in the year 1912. Fig - 16 (left) Recording attachment included a horn, recorder, and a special basket.